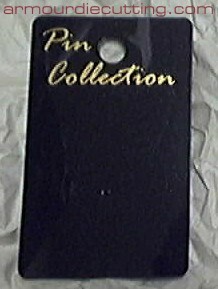 Pin collection hang tag cards to display your pins. two circle holes, one to hang the tag and one hole to poke the pin through. Perfect to display many collectable lapel pins on a rack. If you don't see a menu bar on the left, click here. To order, please scroll down. Be sure to read the entire page, sometimes we sneak in special offers. We specialize in making custom screen printed and die cut items like this. Be sure to contact us if you have any custom projects large or small. hung from racks at the work place, office, store, home or shopping mall. and a new window will pop, displaying your shopping cart. Please hold down your Ctrl button to overide your popup blocker. Credit card transactions are the fastest, safest way to get you items! Order Online Now by clicking the "Add to Cart" button below! click on the Add to Cart button under the bulk quantity you want. Ideal for shopping malls and stores. See our brushed chrome silver and bright PUSH /PULL Decals here. After you place your order, you will receive an e-mail receipt from PayPal. a Payment received, "Shipping" e-mail. Please reply so that we know your order is correct and shipped to the right person. it sure makes people happy knowing they are dealing with a real person who cares! Contact us or see our home page. Distributed Around the World by Armour Die Cutting Service!